Today is Rare Disease Day around the world! Watch as the world wakes up to 28 February 2014 and the beginning of Rare Disease Day. Participants in over 80 countries are holding events for Rare Disease Day. Learn about what is happening around the world, by clicking on the country flags and reading about their events. There are still ways to get involved in Rare Disease Day and spread awareness about people living with a rare disease and their families. In 2014, the theme is Care. 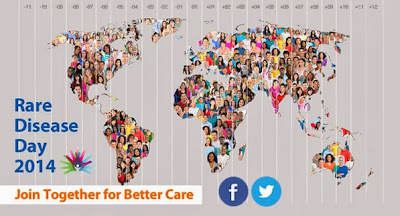 Learn more about the theme and Join Together for Better Care. After Rare Disease Day, participants will be posting photos from their events on the country and event pages, which you can also see directly from the home page. Come back to take a look at the celebrations, advocacy events and people around the world building awareness for the cause. Animation created by NORD, National Organization for Rare Disorders, and shared for all Rare Disease Day supporters around the world to use.